Both the OEM and AL box versions take the same firmware. It is reprogrammable via the USB. Updating the firmware is done to get bug fixes and added features. To adjustment the timing, use the configuration program. Download the latest version and the programming utility by right-clicking the links, then select "Save As...". NOTE: if you are using the custom application setting, reprogramming the firmware will wipe out all the settings. You will need to use the configuration program afterwards to restore them. If you have changed the settings and are not sure you remember what they are, then you should use the configuration program to check them first, as they will be lost. 1) Remove the module from the bike. 2) Remove the box end that the wires come out of. A box cutter works well. Insert as shown and then pry to pop the end out. 5) Connect the USB to your computer. Do not set the board on anything metallic that could short out the back of the board! 6) Execute HIDBootLoader.exe. You will see "Device attached." in the message area. 7) Click "Open Hex File" button and select the above .hex file you downloaded. 8) Click "Program/Verify" button. You should see "Erase/Program/Verify Completed Successfully" after a couple of seconds. 9) All done - unplug the USB. 11) If using the custom application setting, you must now use the configuration program to restore the timing settings! 12) Reassemble/reinstall the module. 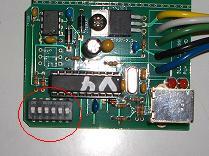 Note on some boxes, the USB side of the board sits in the slot, but the opposite side sits above it. NOTE! Reprogramming the firmware will wipe out all the settings. You will need use the configuration program afterwards to restore them. If you have changed the settings and are not sure you remember what they are, then you should use the configuration program to check them first, as they will be lost. If you have never changed them, then they are at factory stock, and you can restore them by just selecting the factory stock option in the configuration program. 1) This can be done with the module on or off the bike. 2) Remove the end of box opposite that the wires come out of. Take out the two phillips head screws. The end is sealed with a bit of silicon - you may have to pry a bit to pop it loose. 3) Locate the jumper next to the USB port. You will need to short across these pins with something metal. You can use the screwdriver you just used to remove the end plate. 4) Connect the USB to your computer while shorting the jumper. Note - I find it easiest to first connect the USB to the module and then use one hand to hold a screwdriver tip across the jumper while using your other hand to plug the USB in the computer. You may also be able to just rest the screwdriver across the jumper without the need to hold it. 5) Execute HIDBootLoader.exe. You will see "Device attached." in the message area. 6) Click "Open Hex File" button and select the above .hex file you downloaded. 7) Click "Program/Verify" button. You should see "Erase/Program/Verify Completed Successfully" after a couple of seconds. 8) Firmware programming done - You must now use the configuration program to restore the timing settings! 9) Unplug the USB and reassemble/reinstall the module. Put a bit of fresh sealer on the end if you want to insure it is watertight.